In the Cutting Chart, A: Olive, from the 4-1/2″ x WOFQ strip, cut one 12-1/2″ x 4-1/2″ piece and one 4-1/2″ x 2-1/2″ piece. In Block A, sixth row, the right neutral piece should be 3-1/2″ wide. * If you plan to long arm quilt this project, you will need additional yardage in order to mount the backing to the frame. 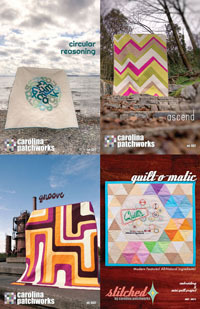 All patterns mailing after 7/15/09 will have a sticker covering the incorrect text with the correct text. The art will be changed on future reprints. 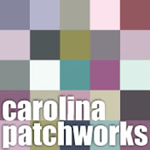 If you pattern has the incorrect text and you would like a sticker please email me — emily [at] carolinapatchworks [dot] com — with your address and I will mail a sticker to you.